Want to go beyond standard account-based tracking in QuickBooks®? Expanding into class tracking provides you with a customizable way to track specific expenses, categorize shared expenses across multiple accounts, and handle the accounting for one-off and occasional expenses that aren’t necessarily associated with a particular account type. 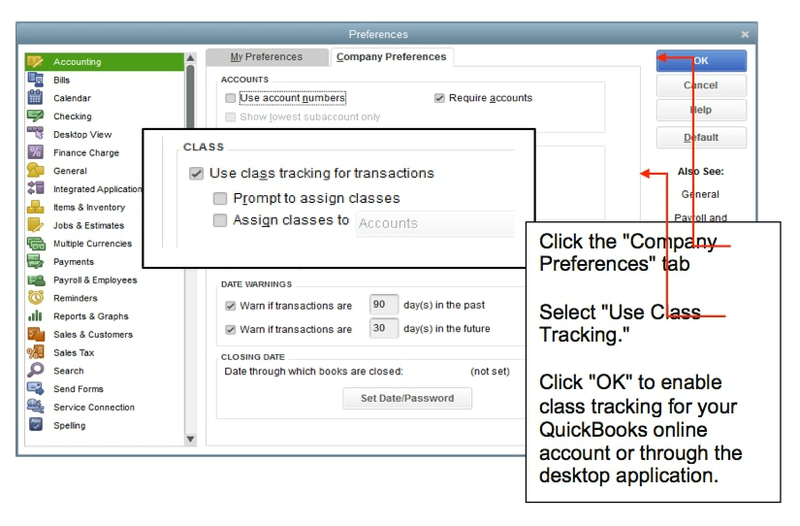 QuickBooks offers a user-friendly method for setting up class tracking, allowing you to get up and running quickly. Greater control over expense categorization is the primary benefit of class tracking, which makes sorting expenses easier. 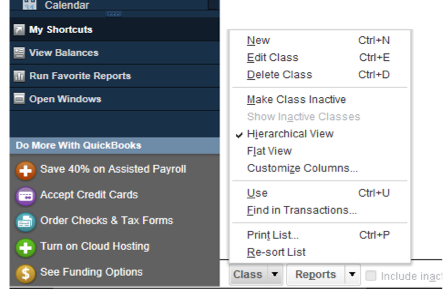 In QuickBooks, you can create classes that you assign to transactions. This lets you track account balances by department, business office or location, separate properties you own, or any other meaningful breakdown of your business. Many business owners have certain segments of their business that they want to keep a close eye on; by using the class tracking feature, you can define these segments and track their associated account balances on invoices, bills, and other documents. Businesses with different departments or locations can use classes to report account balances for each department. For example, if you had a restaurant with three locations, you might create an Uptown, a Midtown and a Downtown class for tracking account balances by location. A farmer might create a class for each enterprise – for example, Corn, Hogs and Soybeans. At the end of an accounting period, the restaurant could create separate reports for each location. Likewise, the farmer could create separate reports for each enterprise. Class tracking takes some time to set up, but it pays off in the long run. You get an excellent overview of your company expenses and can see how your money is being spent. With this information, it’s much easier to stay on top of your budget. Load the main page of the QuickBooks application. The class tracking option is now available on your company profile. Next, select your lists from the menu bar at the top of the screen. 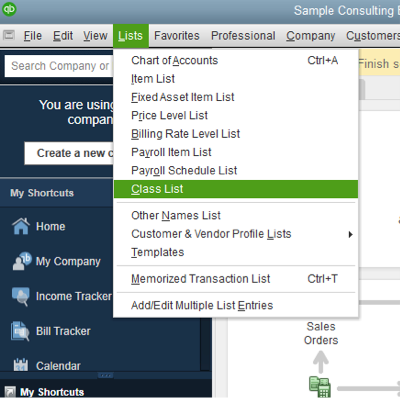 Click “Class List” to set up class categories for your expenses and accounts. Click the arrow next to the “Class” button at the bottom of the page. Click “New” to create a new class. The class types you create can account for a variety of expenses, such as outsourcing costs, technology solutions, travel costs and other common payments. Input the name associated with the class. If this class can be broken down further, put a check in the box next to “Sub-class” and enter the information in its text fields. Associate the class with a specific expense by choosing it on the expense input form when you enter the information. Classes can be associated with any entry you make in QuickBooks, but it’s particularly useful for your bills and payroll costs.